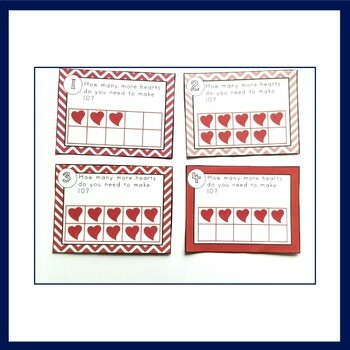 Making a set of ten is one of the skills Kindergarten students should master! 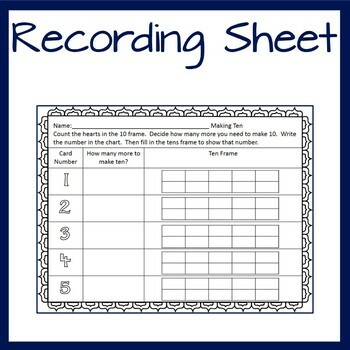 Partners of ten is a key part of becoming fluent with addition and subtraction facts. 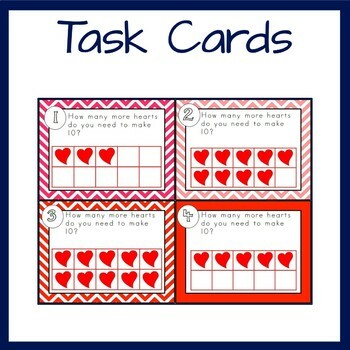 With this center activity, students will count the number of hearts in the ten frame and figure out how many more are needed to make a total of ten. This is a low prep activity. You can laminate the task cards if desired but it isn't necesary. It is perfect for Kindergarten teachers. When I taught Kindergarten, this was one of our math centers. 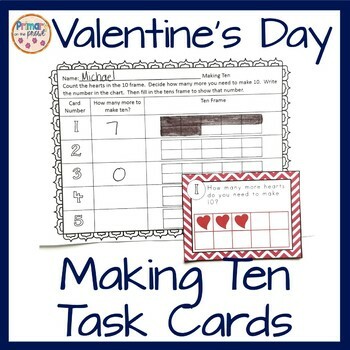 During the week of Valentine's Day, I would hang the task cards up around the room and students would walk from card to card and fill out the recording sheet. This center can be found in a $$ saving bundle! Valentine's Day CVC Reading practice- Differentiated in 2 Ways!